Lamprey are ancient fish with fascinating life cycles. With a fossil record dating back 400 million years, these amazing creatures have long been an important part of Pacific Northwest Native American culture, and are integral to nutrient cycles that support other plants and animals. In spring 2017, JCWC volunteers conducted our first lamprey surveys. 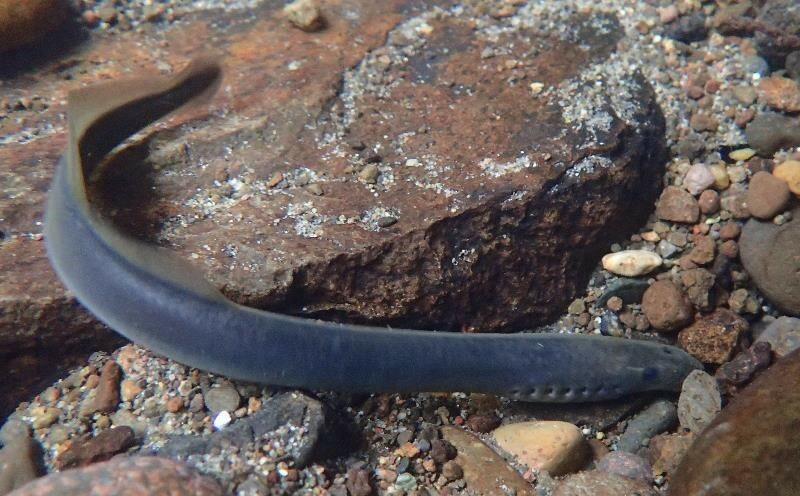 Two lamprey species inhabit the Johnson Creek Watershed: western brook lamprey and Pacific lamprey. Both species build redds, or nests, in the substrate of freshwater streams, in which they lay and fertilize their eggs. Their preferred habitat for nesting is in gravelly, shallow, fast-moving water. (This nest-building behavior is shared by salmon and steelhead trout.) After hatching, lamprey ammocoetes, or larvae, spend two to seven years buried in the sediment as filter-feeders before metamorphosing into their adult form. Adult brook lamprey are just bigger than pencils and live their entire lives in freshwater streams. Once they metamorphose, brook lamprey spend only a few months in their adult form, during which time they spawn and usher in a new generation of lamprey. In fact, all of their energy is focused on this important event–they do not even eat as adults! 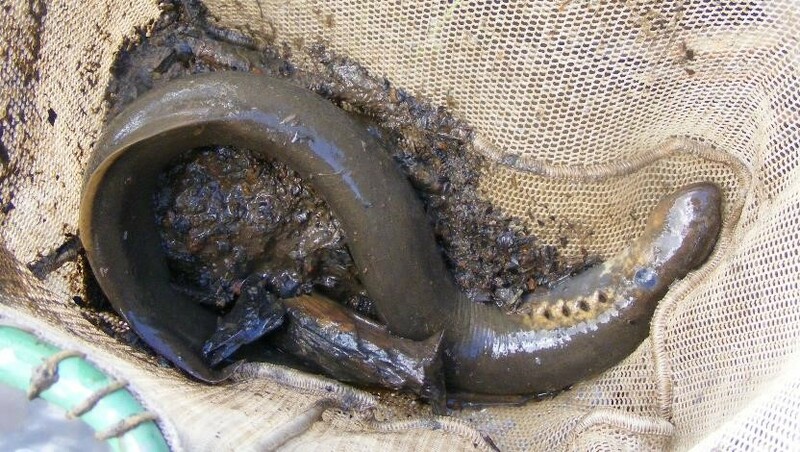 Adult Pacific lamprey found during culvert construction, 2016. Adult Pacific lamprey are much larger than brook lamprey, at about 15-25 inches long. During their two to three years of adulthood, Pacific lamprey first live a parasitic life in the ocean, feeding on fish and other marine mammals with their sucker-like mouths. Some predators of Pacific lamprey include sea lions and sharks, and they are an important part of ocean ecosystems. It is important to acknowledge the cultural relevance and close relationship of local tribes to the Pacific lamprey. Pacific lamprey have long been a source of subsistence and cultural identity for the tribal people of the Pacific Coast and interior Columbia River basin. Tribal elders also regard this food as medicine: Lamprey is given to them when they are ill, and it helps them to recover their health. Members of Pacific Northwest tribes travel great distances to harvest Pacific lamprey from Willamette Falls near Portland. JCWC is honored to partner with two local Native American groups in our lamprey program: Wisdom of the Elders and PSU’s Indigenous Nations Studies Program. Lamprey are an important part of Pacific Northwest food webs. During their juvenile life stage, they are a food source for salmon and other fish species, as well as gulls and terns. Adult Pacific lamprey are high in fat, and are an important food source for sea lions. Although adult Pacific lamprey live a parasitic life in the ocean, they are able to successfully coexist with their host species and do not constitute a threat to their survival. The US Fish & Wildlife Service maps Pacific lamprey sightings that have been documented across the country; check out their data here. Lamprey numbers have not been well documented over time, but anecdotal sightings indicate Pacific lamprey have declined over the past years. This is a cause for concern because it may indicate problems of habitat loss, water quality, or barriers such as dams. Pairs of volunteers surveyed at least one of seven mile-long reaches scattered throughout the Johnson Creek watershed. Each survey took about three hours. Volunteers donned chest waders, polarized sunglasses, gloves, and wading poles for safety before setting out, then walked through the water or along the banks, documenting redds, live fish, and fish carcasses along the way. The results from these surveys will help us better understand how lamprey are distributed in our watershed, which will help scientists address conservation and plan restoration projects. The map below depicts lamprey sightings during the 2017 surveys. 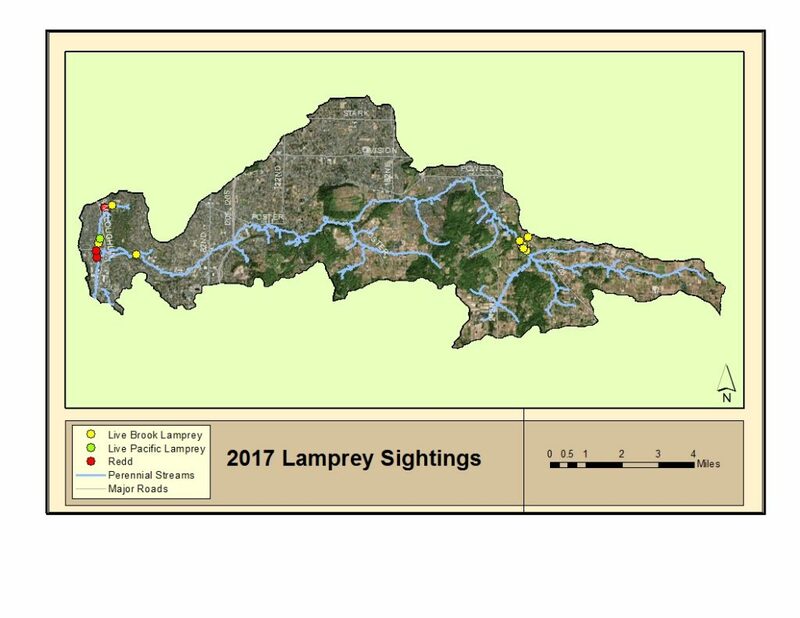 No confirmed Pacific lamprey were sighted in this year’s surveys, but one possible sighting was documented in Crystal Springs. We do know, however, that Pacific lamprey are in our watershed! Outside of JCWC surveys, this elusive fish has been documented in the Johnson Creek Watershed at least five times since 2000. Recently, during a culvert replacement on Badger Creek, an adult Pacific lamprey was found–the photo is above and on our fish passage page. The Pacific Lamprey Conservation Initiative also documents Pacific lamprey distribution in the Pacific Northwest. By visiting their map page and zooming into Johnson Creek, you can see the locations of some past sightings. The following table summarizes what was seen in the 2017 JCWC surveys. “Confirmed” indicates certainty that a lamprey or redd was spotted. In general, lampreys were confirmed via photos or videos, and redds were considered “confirmed” if lamprey were documented in them. Along with lampreys, volunteers also documented steelhead trout and largescale suckers!